Logroño is the capital and main wine hub of the famous and beautiful La Rioja region and is simply a must-visit destination for any wine lover and foodie. For hundreds of years, Logroño has been the administrative and commercial center of the Riojan wine trade – wineries have been founded, expanded upon and changed hands within these walls. Situated on the banks of the River Ebro, it is the largest and most dynamic town in Rioja, with enough interesting and elegant shops, bars and historical attractions to satisfy the most demanding of visitors! But, the main reason for wandering the streets of this historic city must surely be to enjoy tapas and a glass of Rioja in this vibrant wine city, which has a wealth of restaurants and tapas bars serving the best of the local cuisine. Logroño is located in the La Rioja Alta sub-zone, one of the three sub-zones that constitute this historic wine region. It lies close to the boundaries of both Rioja Alavesa, which is mainly situated in the Basque province of Álava, and to the largest Rioja sub-region – Rioja Baja. There is a history of vine cultivation in this part of north-eastern Spain that stretches back over a thousand years; indeed the wines from this region are included in the oldest Denominación de Origen (appellation) in Spain. Historians believe that Logroño began its life as a Roman settlement called Vareia, which was actually situated over 1 Kilometer away from where the current city center is today. However, after the Roman military presence in Spain dissipated with the collapse of the Western Roman Empire in the 5th century AD, Vareia was destroyed by the Gothic tribes of King Leovilgildo in 574. After the destruction of the settlement, King Leovilgildo allowed the surviving population to construct a new settlement on the banks of river Ebro and so Logroño was re-born as the place we know today. Its importance as a trading and commercial center grew, and this was a relatively peaceful and prosperous time for the settlement. Large parts of Spain were controlled by the Germanic Visigoth Tribes until the 8th century, who established a capital over ‘Hispania’ in Toledo. However, their control was overthrown with the arrival of the Moors from North Africa in 711, who quickly subdued the population in Andalucía, although parts of northern Spain remained independent. In the 9th century AD, Logroño and the Rioja region were temporarily captured by the Moors although the area was subsequently liberated by the Navarran ruler King Ordono over 100 years later. Thereafter, the claim over this territory was disputed between the Kingdom of Navarra and Castile, the region was finally annexed to Castile in the 11th century, although Logroño was ransacked in 1092 as punishment for its loyalty to the Castilian King Alfonso VI. However, Alfonso oversaw the restoration of the city and as a reward for Logroño’s loyalty, he granted its citizens a charter of rights in 1095, including rights to lower taxation and civil liberties. In the Middle Ages, Logroño developed into a significant economic and cultural center and an important stop on the Santiago de Compostela pilgrimage route. Since the 10th century, Pilgrims had been traveling through Rioja to reach Galicia, with their arrival came cultural development and the emergence of a new merchant class. The wines of the region were also starting to gain official recognition and became a vital part of Logroño’s prosperous economy. Subsequently, in 1635 the Mayor of Logroño banned carriages from passing along the roads near to the Bodegas, worried that the vibrations would disturb the wines! However, Logroño was also at the center of a long-running feud between the Kingdoms of Castile and Navarra during this period, who wished to re-conquer the valuable Riojan territory. Being Rioja’s unofficial capital, the city was attacked on more than one occasion, although the Navarrans never successfully managed to take the region back into their control. From the 16th to the 18th century the city expanded considerably – existing churches were enlarged, new civic buildings constructed and Logroño’s prize Cathedral – Santa Maria de la Redonda – was completed in 1762. In 1787 the Royal Economic Society of Rioja Wine Producers was established, with the dual aim of encouraging the cultivation of vines and promoting Rioja’s cultural development. After the relative calm and prosperity of the 18th century, the 1800s would herald many social, economic and political upheavals for the citizens of Logroño, the most significant being the Carlist Wars and France’s invasion of Spain during the Napoleonic wars. But, despite the conflicts of the 19th century, Rioja’s modern wine industry was formed in this period, with the inauguration of its first winery, Marques de Riscal, in 1860. It was during the latter half of this century that Rioja’s connection with France began when French vineyards were largely destroyed by the parasite Phylloxera. Needing unaffected vineyards to produce wines, many Bordeaux winemakers came to Rioja and founded wine estates, having discovered favorable conditions for growing the Riojan red varieties – Tempranillo, Garnacha, Mazuelo, and Graciano. They also brought with them the first Cabernet Sauvignon vines, which are still used in some blends today. In the 20th century, Logroño was, like all Spanish cities, affected by the outbreak of the Spanish Civil War between General Franco’s forces and the Republicans. The war cost the lives of over 700,000 Spanish nationals and after his victory, the Fascist Dictator, Francisco Franco, ruled Spain with a rod of iron until 1975. Logroño, however, was relatively undisturbed by the events of the Second World War as Spain refused to take sides in the conflict. When Franco died in 1975 and the country eased into democracy, the Riojan winemakers benefited from increased trade with the outside world. Indeed, the 20th century was an extremely progressive time for the wine industry in Logroño and of course the entire region. In 1926 a Consejo Regulador (Regulatory board) was established in the city, which gave official legal recognition to the wines of Rioja and set the geographical boundaries and rules of production. The board attained legal status in 1945 and finally became officially established in 1953. A further honor was given to the wines of Rioja when in 1991, a Ministerial order granted a superior designation to be added to all wines – the Denominacion de Origen Calificada Rioja (DOCa). Today, Logroño continues to attract wine-lovers from all over the world as the historical and commercial center of the Rioja wine region. It exists as that most rarified of 21st-century cities – a place where the past has been carefully preserved without forgetting about its future development. It is a vibrant, dynamic but extremely welcoming city and locals are known for their sense of fun and hospitality, as any visitor to Logroño’s old quarter will testify. Its tapas bars, excellent restaurants, lively festivities, beautiful architecture, wineries, and ambiance, add up to a memorable city definitely not to be missed! 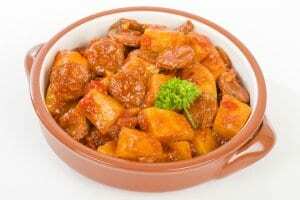 Patatas a la Riojanas, a fantastic stew of potato, chorizo (spicy paprika sausage) garlic, onion, and peppers. The city has long been the center of the Riojan wine trade and unsurprisingly a staggering amount of different red and white wines can be found in Logroños shops and restaurants. Today, traditional Rioja blends that were aged in American oak are being supplanted by more modern, fruit-driven styles that are matured in French barrels. The key grape is Tempranillo, which typically produces wine with aromas of cherry and red fruit and can age for many decades. It can be light, elegant and aromatic or deep, intense and concentrated depending on the style adopted by the Bodega. Much progress has also been made in the white and rose department and modern style white Riojas are now some of the best white wines being produced in Spain today. The main grapes are Viura and Malvasia, look out for the whites of Finca Allende for a real treat. This historic cathedral dominates the city’s skyline with its twin towers and facade in beautiful dressed stone. Construction started in the 16th century but it was not until 1762 that Santa Maria was completed. The interior is dressed with beautiful artwork, including one painting by Michelangelo and the organ and choir are some of the finest in Spain. Imperial Santa Maria de Palacio – Located on the important thoroughfare of the Calle Mayor parallel to the river Ebro, this church is the oldest in Logroño and boasts an impressive pyramid Gothic spire. Construction began in the 12th century and was not finished until the 17th. About half an hour’s drive from Logroño, Haro is a smaller, but a very enchanting town that has been an important hub of viticultural activity in Rioja for centuries. It was built on the sides and top of a hill on the southern slopes of the Obarenes Mountains at the mouth of the river Tiron. Its small, compact center is easy to stroll around and contains a fantastic square, known as La Plaza de la Paz which is full of excellent tapas bars, cafes, and restaurants. Rioja is well known for its exquisite roast meats and delicious hearty wine country fare. Sometimes though after a few days in the Winelands, you need to break up these meals with something lighter and more innovative and La Galeria offers refreshingly creative cuisine with a lighter touch. Chef José Felix Rodríguez has worked with some of Spain’s top chefs including Arzak, Berasetegui and Koldo Royo and his cooking is noted for its heavy use of fresh seasonal vegetables. Rioja is known as the vegetable basket of Spain after all! Sommelier and co-owner Rául Martinez make magical wine pairings to accompany the tasting menus. Logroño’s historic old town is one of the liveliest and most inviting in Spain. At night it is transformed into a noisy meeting place, crammed with people seriously intent on enjoying themselves in true Riojan style. Over 50 excellent restaurants and tapas bars abound in and just next to the famous Calle Laurel street, the problem is choosing where to start! Bars and restaurants will typically serve young, fruity reds to accompany tapas, although an abundance of older vintages are also waiting to be enjoyed. Casa Matute is great for inexpensive, brilliantly prepared classic Riojan tapas and home cooking. Cid is known for its grilled wild mushrooms. La Taberna Laurel brings in hoards for their patatas bravas. 1521 Wine Bar do a great pintxo with quail’s egg, chorizo and red pepper on toasted baguette. Taberna de Baco make a lovely tapa of paté, goat’s cheese, green apple, and caramel. The best way to enjoy Logroño’s nightlife is indeed to go for a wander from bar to bar on Calle Laurel ‘drinking in’ not only the wines and tapas but also the incredible atmosphere.